Fifteen years ago today, excited Burmese citizens went to cast votes in the first democratic elections the country had seen in decades. Fifteen years ago today, after thousands had sacrificed their lives for a hopeful tomorrow, a democratic election was held. 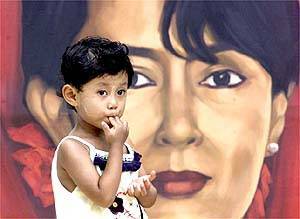 Fifteen years ago today, an NLD Opposition Party led by Aung San Suu Kyi won nearly 80% of the national vote. Fifteen years ago today, a hopeful nation celebrated a New Day for Burma. 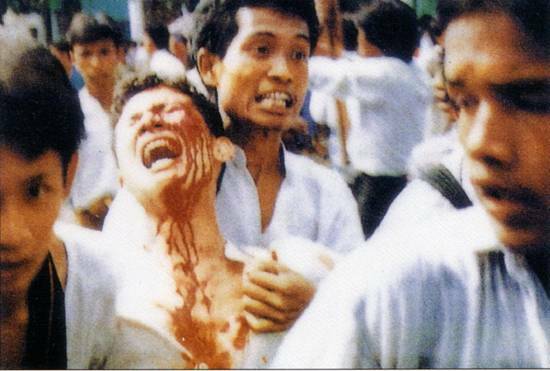 It was fifteen years ago today that the military junta stole the democratic election from the people of Burma. So, what lies ahead for this suffering people? My entire family woke up early that day. Our neighbors were already leaving their homes. Some eagerly shouted at us not to be late. My 63-year-old grandmother and my mother joined them and I rushed to follow. It was election day—May 27, 1990—the first time in 30 years the Burmese people had been called on to go to the polls. I had just turned 18 like many of my friends. We thought ourselves very lucky to be voting in such an historic election, one which we were confident would lead our country towards democracy. Around 20 million people, about half Burma’s population, were eligible to vote that day. My family and I joined the more than 15 million throughout the country who turned out to exercise that long-withheld right. The final returns gave the NLD more than 80 percent of the vote, and a total of 392 of the 485 seats contested in the 492-member assembly. The military regime-backed National Unity Party (NUP), formerly the Burma Socialist Programme Party led by late dictator Ne Win, captured just 10 seats. An NLD member was asked by a foreign reporter whether she thought the regime would now relinquish power. She dismissed the question as nonsense in view of the huge support for the party. The junta completely ignored the election result, and continues to live in fear of exercising this most basic display of democracy. In the 15 years since the election, Burma should have gone to the polls a further three times. Theoretically, however, the parliament elected in 1990 should now be in session, its members sitting as free men and women instead of languishing in jail or living in exile. A truly representative government should be ruling Burma in place of the self-appointed, self-serving dictators now in charge. The NLD landslide victory had fuelled fears within the regime that if they gave up power they might face trial for human rights abuses. 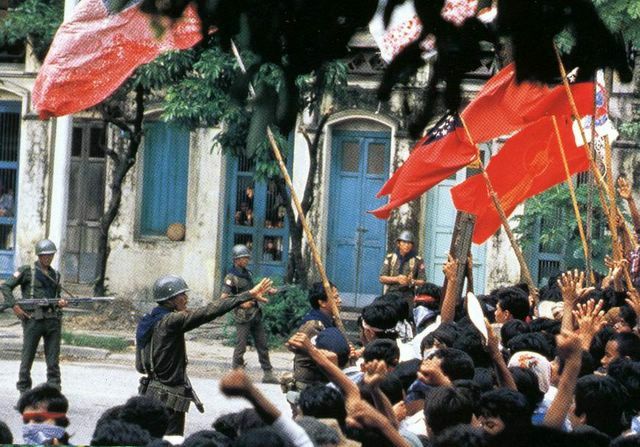 The paranoia was so intense that one senior NLD leader, Kyi Maung, was jailed for actually rejecting that possibility by bringing up the precedent of the Nuremberg war crimes tribunal. 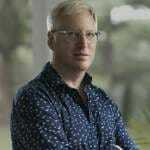 “Here in Burma we do not need any Nuremberg-style tribunal,” he said—and found himself behind bars for the indiscretion. NLD Leader, Aung San Suu Kyi, is still under house arrest in the junta. The US again called for her release yesterday. Jail cells instead of parliamentary seats awaited many of the winning candidates, however. A ruthless purge of the opposition occurred in the six months following the election, and responsible citizens like San San were sentenced to totally unjust and unrealistic prison terms. 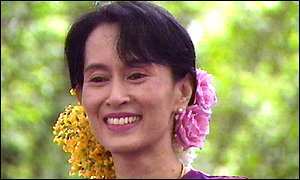 NLD leader Aung San Suu Kyi was harassed and sentenced to successive terms of house arrest. She’s still in detention today. There were persistent and credible reports of torture, violent deaths and appalling prison conditions. Three elected NLD members—Tin Maung Win, Hla Than and Saw Win—died behind bars. Fifteen are still in jail, all of them over 60 and probably destined to end their days there. For its part, the regime allowed three years to pass before making a move. In 1993 it called a National Convention, attended by 702 delegates. Only 147 of them were elected parliamentarians or representatives of political parties. The rest were hand-picked by the junta. A riot in 1999. The situation is still extremely violent in Burma. Suu Kyi has felt the fury of the regime many times. During an election campaign tour in Danubyu, Irrawaddy Division, in 1989, an army captain ordered her party to halt. She kept walking—towards the muzzles of soldiers blocking the road. The captain ordered the squad to prepare to fire, and only the counter-command of a senior officer saved Suu Kyi from being gunned down. NLD leader Suu Kyi made stabs at getting the regime to recognize the results of the 1990 election, but she was blocked at every turn. It was a cry in the dark. * Burma (Myanmar) today is listed as one of the “Six Outposts of Tyranny” by the Bush Administration. * The government has been accused of using chemical weapons in their constant military campaign against rebel forces. * Burma is ranked “Number One” in the global forced labor rankings. * The government is accused of using prisoners and civilians as human minesweepers, forced to walk ahead of the soldiers. * The economy is in ruins. There is virtually no industry or investment besides a controversial French oil contract. * In April, the Shan minority leaders declared independence of the Shan State from the government rule. At least 11 were killed in a bombing at a shopping center in Rangoon, this month. The government blamed it on the Opposition who denied the charges. In a new offensive in Shan state, the Burmese army and its proxies have targeted and forcibly relocated thousands of civilians, Human Rights Watch said today. Thailand must allow civilians to cross the border to gain sanctuary from these attacks. Thai government sources told Human Rights Watch that Burmese troops were burning down entire villages in Shan state. Approximately 100,000 Burmese government troops backed by forces of the United Wa State Army (UWSA), are implementing a counterinsurgency strategy against the Shan State Army (SSA). Government forces and the UWSA have regularly targeted civilians by forcing whole villages to relocate. There are reports that they have also singled out young Shan men for execution, and have raped Shan women and girls.